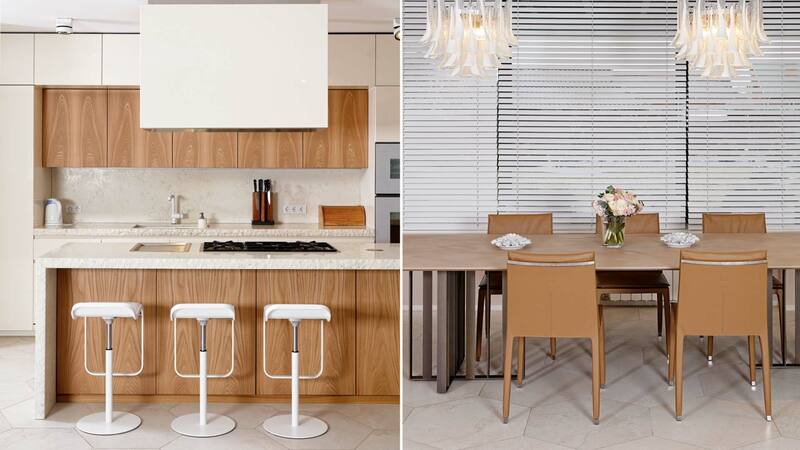 Two volumes for a TM Italia stone and wood elm kitchen designed by Anna Turcina and installed in Kiev. 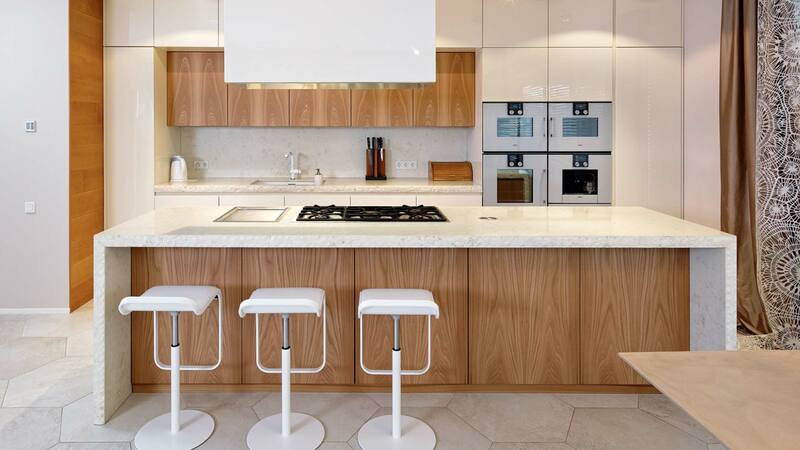 This kitchen with island consists of two volumes: a wall composition and freestanding island. The linear composition, occupying the full height of the wall, has been created with D90 concept doors with a cream white brushed glossy finish for the bases and pantry columns with push-n-pull mechanisms. 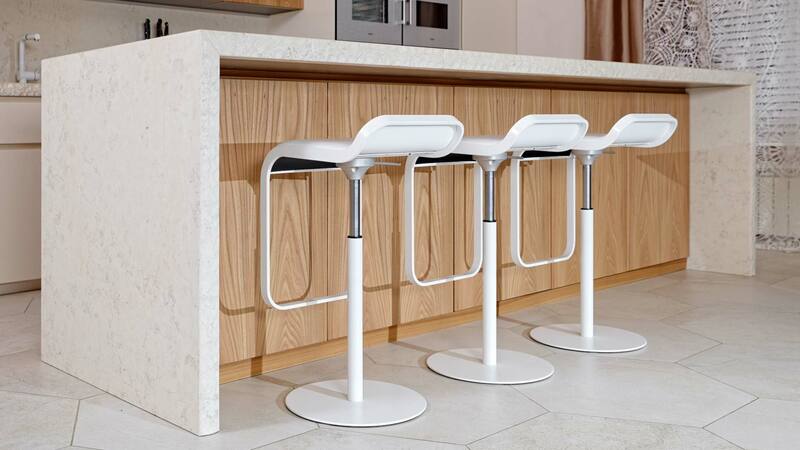 The bases of the kitchen are modelled on the T45 concept. A niche opens between the columns and contains wall cabinets made from elm with a seamless vertical crown-cut finish, LED lighting touch button, and a worktop, complete with backsplash panel, made of Bianco Perlino stone, into which an undermount sink has been installed. 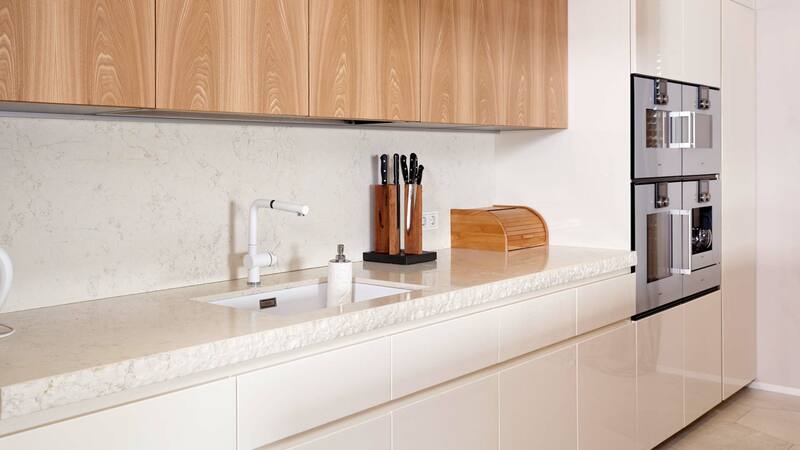 The island is made up of Bianco Perlino stone sides and top, which includes two stove tops and the depth that allows for a snack counter; below, the T45 concept bases employ the same elm finish as the wall cabinets. Above the island, a Maxfire hood is suspended, clad in panels with a cream white brushed glossy finish. Completing the interior project Lapalma stools, Poltrona Frau chairs and a Lema table.